The air may still be cool, but every day or so we get a sunny warm one. I consider anything in the double digits (even 10 degrees Celsius) warm this time of year. I've even been known to go out sunbathing on the deck if there's no accompanying wind. 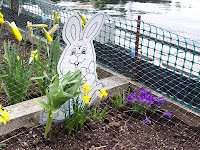 Last week I took one glorious day to get my garden ready for the planting. I pulled the last of my carrots. They wintered in the ground just fine with only a few nibbles on the tops (mice or insects?). I cleaned them up and put them in the fridge to use. I left a row of curly kale for now. The plants have small curly leaves on top of tall stalks. That's the result of picking a few leaves at a time over time. I really love curly kale. It's so versatile both raw and cooked. 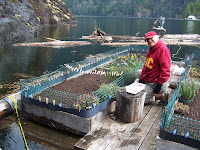 I dug in steer manure to all of my float garden raised beds and pots on the deck. I will let it rest and marry with my dirt until mid-April. That way when I plant my seeds directly into the soil it won't be too strong and burn their tender roots and shoots. It's compact and light weight. The battery lasts a long time. It can hold over 1,000 books. Amazon maintains your archived library. 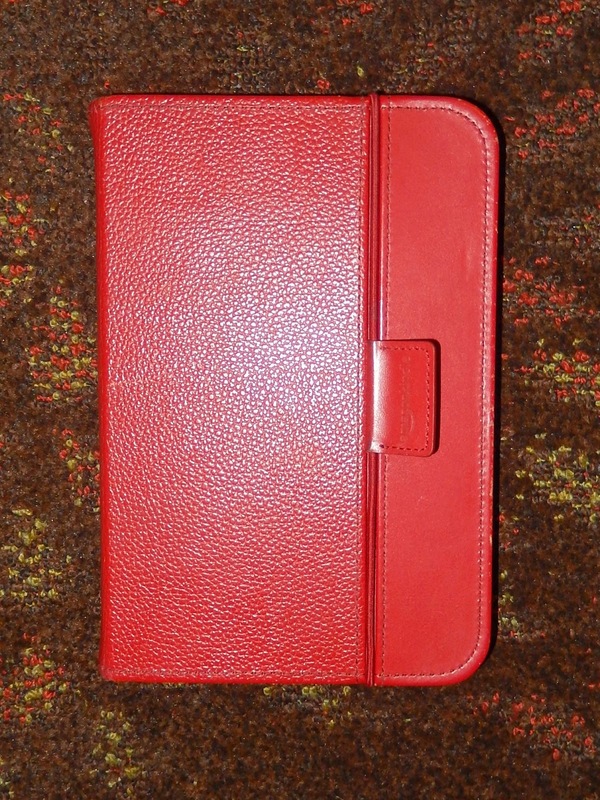 A case with a built-in light runs off the Kindle battery. You can adjust the font size. You can read it in bright sunlight. You can buy books from your Kindle or computer. You can wirelessly download books. eBooks are less expensive than printed ones. There are literally thousands of titles to choose from. Many books are free or very low cost. You can electronically search book contents. I got mine over three years ago. You can see she's had lots of use. This model is similar to the basic Kindle that now sells for $69. 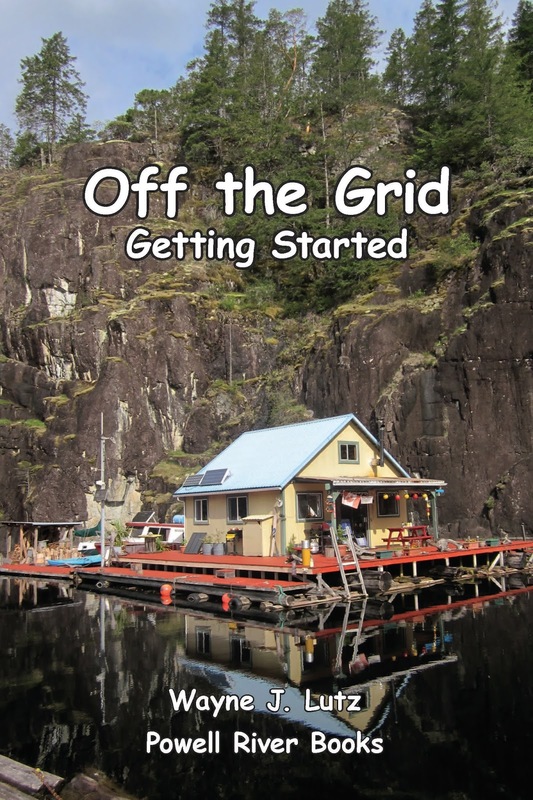 It's perfect for off-the-grid living. I load it up with books during trips to town and then have plenty to read up at the cabin. The Kindle (and other e-readers) have revolutionized the publishing industry, especially for self-published authors like my husband Wayne. 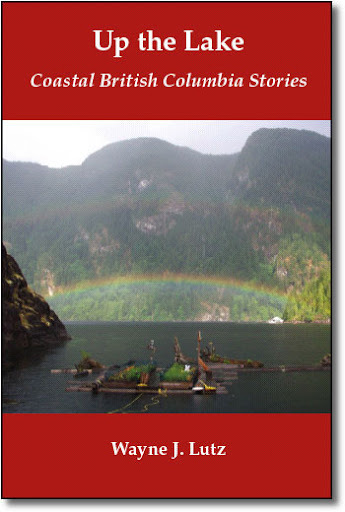 It's relatively easy to get a manuscript into the electronic format necessary for online sales. And there's no investment required for publishing printed copies. 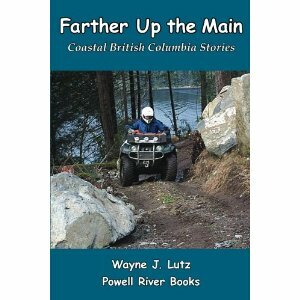 If you don't have a Kindle, you can still read books (including Wayne's) that are available through Amazon.com. They offer a free Kindle App for computers and most handheld devices and smart phones. Want something with more bells and whistles? They even have a Kindle for that. I have a friend in Powell River that's also named Margaret. We both have float cabins up the lake, and they were both built by our friend John. Margaret and her husband Art are the proud owners of a very popular restaurant named Magpie's Diner. Margaret started Magpie's Diner on Glacier Street. When that location became too small, she moved to the Townsite's historic Rodmay Hotel and reopened it's cafe as Magpie's Diner. This year, Magpie's has moved once again, to an even larger space in the community of Cranberry. Magpie's Diner serves breakfast and lunch seven days a week from 7:00 a.m. to 3:00 p.m. We like to stop for breakfast when we are heading into town. We usually order the same thing, a cheese omelet with a side of spicy chorizo sausage for Wayne, and the Not-So-Big Big Breakfast for me with one egg, breakfast meats, homemade hash browns, and toast. But everything on the menu is great from all day breakfasts, to Bennies, salads, sandwiches, burgers, and homemade desserts. You can even get a bottle of Townsite beer to go with your meal. I love the new location. The building is an historic structure that housed Wilshire's Store. The old counter and stools are still in use. Margaret invites local artists to display on her walls, and she uses local produce and products whenever possible. 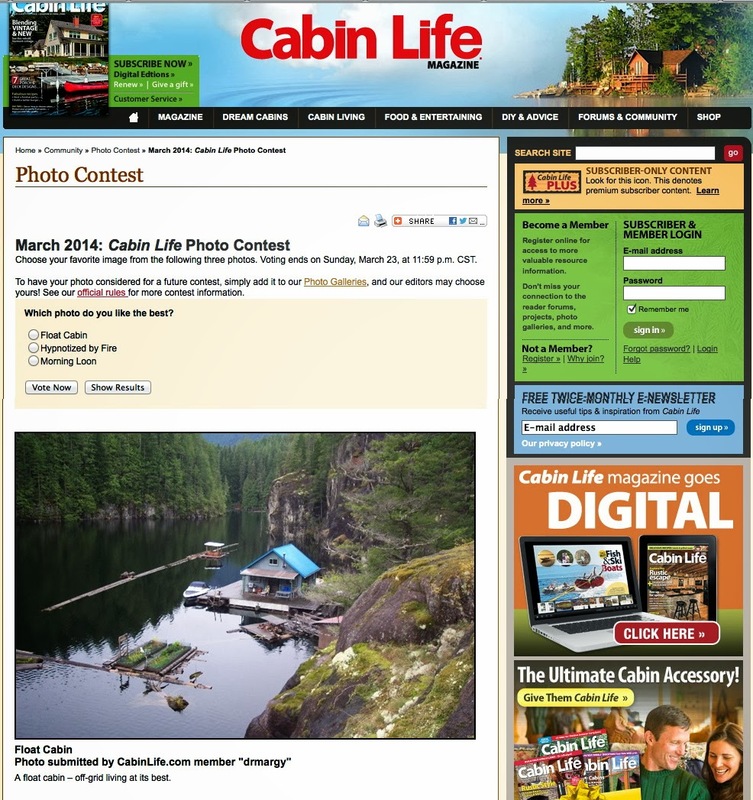 Voting for the March Cabin Life Magazine March Photo Contest ended Sunday, March 23. 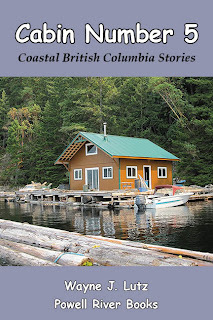 It was an honour to have our float cabin home as a finalist. Spring often brings us foggy days up Powell Lake. Following a rain or snow, the forecast usually calls for sunny. We know that usually means foggy. That can mean a tricky boat ride if we have to head down the lake. We have to careful when we plant our garden. If it's too early in March, it coincides with the arrival of the Oregon Juncos. They're cute little birds, but they have a voracious appetite. And a favourite food is just planted seeds. I learned the hard way early in my gardening career. It was mid-March. 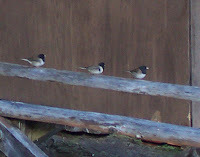 We noticed three Oregon Juncos at our cabin. We didn't think much of it at the time. They only seemed interested in the wild bird seed we had strategically placed by our bird houses. Three days later, the Juncos multiplied into twenty and attacked our garden with a vengeance. We quickly pulled bird netting across the just planted beds. That didn't stop them one bit. They squeezed through the small holes in our plastic fencing. I got some some plastic lawn borders and closed every gap. The Juncos continued to search for openings, and when that failed, they bounced on the netting like a trampoline. It was quite a sight. This was the last step in replacing the float cabin anchor cable. 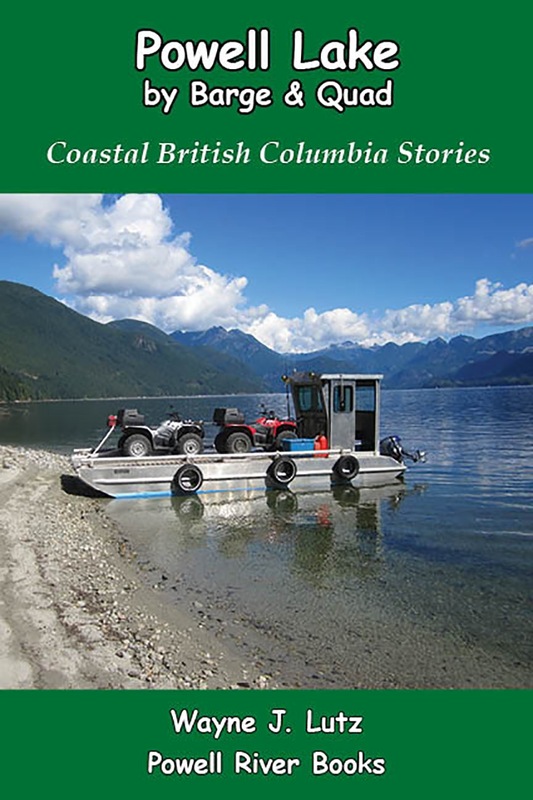 Once Wayne pulled the tin boat all the way across to the cliff, he jumped out to carry the free end up to the anchor bolt that had a welded eye large enough to receive the thick cable. John joined Wayne and they pulled the cable through the eye until it had the proper amount of slack. You don't want it too tight because it would create excessive tension during wind storms, and there wouldn't be enough slack for changes in the lake's water level. You don't want it too loose or the cabin's position wouldn't be right, and it would swing too much on windy days. John's trained eye can tell just the right amount of swag. Wayne held the cable in place as John installed two cable clamps. Tightened "John tight" with a socket wrench they won't be slipping or coming off during even the worst storms. The last thing was to remove the cable from the log and let it fall into place. Perfect! The hard part came next. Fortunately, John had already strung a rope across the water to the bolt anchored into the granite wall. John wound the rest of the cable into a tin boat while Wayne feed it to him, avoiding any twists. Wayne used the rope to pull the tin boat over to the rock wall while John let out the steel cable. It's important not to let it sink to the bottom. It could snag on sunken logs or rocks. The process was a balance between slowly extending the cable and pulling it across. 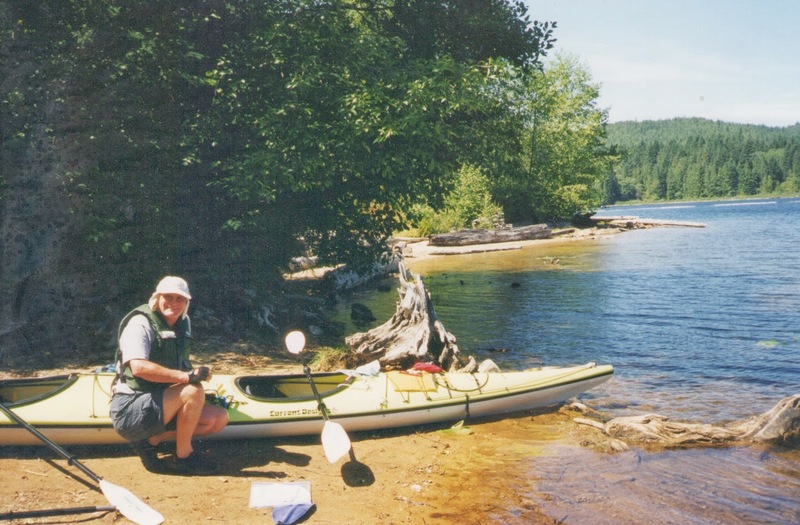 John used a stray log as an attachment point for extra buoyancy. It just happened to be floating next to the cabin. John is such a resourceful guy. He can think things out in his head on the fly. A log, a hammer, a staple, and a piece of rope transformed into a mechanical advantage. Following our good friend John, Wayne and I learn lots about float cabin construction. 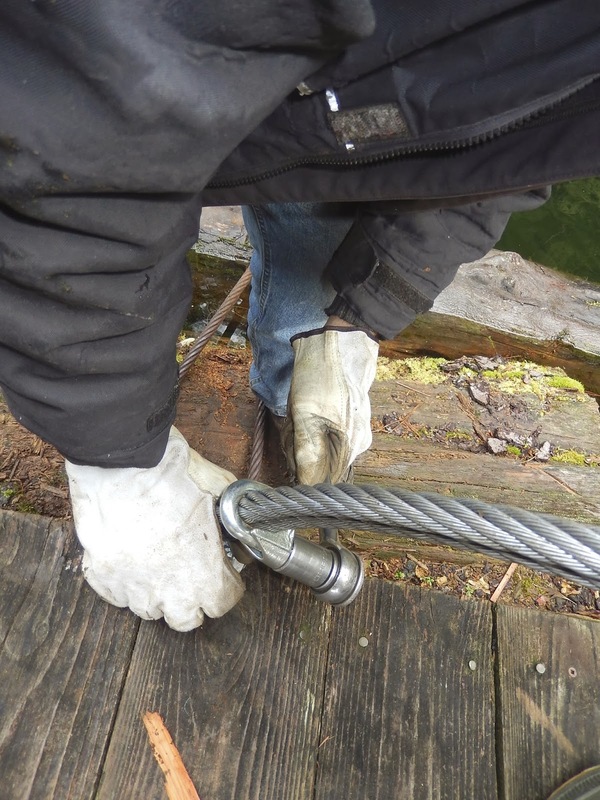 Recently, we went along on an anchor cable repair job. Float cabins are secured to shore with either heavy ropes or steel cables. John is of the steel cable persuasion. But even hefty cables rust and weaken over time. Then, if there's a strong wind, they can break. This cable wore thin and broke right in the middle. When it's happened at our cabin, they've broken at shore anchor bolts and cabin connections. No matter where it breaks, an anchor cable must be quickly repaired. First, John used a long rope as a temporary solution. Then he ordered new cable for a permanent fix. Wayne and I met up with John at the Shinglemill Marina just as he was loading the heavy spool onto the back of his boat. John is very resourceful, but cable is VERY heavy. At the cabin, Wayne helped John unroll the cable. Using cable clamps and a socket wrench, John made a loop to attach one end of the cable to a large chain at the corner of the cabin. He recited his saying, "never saddle a dead horse" to remind us of the proper clamp placement. Once it was "John tight," he was ready for phase two of the installation. In the West, this was the winter that almost wasn't was. But recently, we've been making up for it with more than the average number of snowy days. Along with them, came some zero degree nights and days. That makes lots of puddles into miniature ice rinks, just the right size for field mice on tiny little skates. 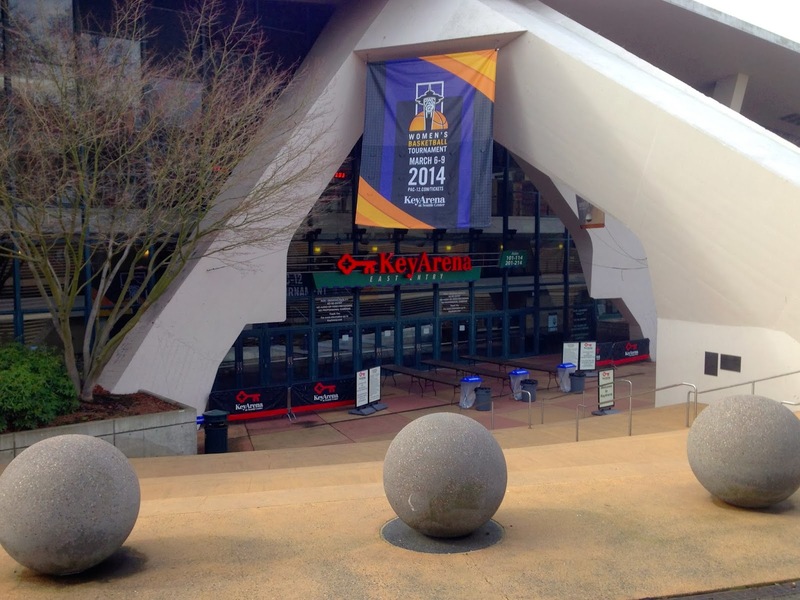 Wayne and I spent last weekend enjoying the PAC-12 Women's Basketball Tournament at Key Arena in Seattle, Washington. Throughout the season, we traveled to watch the USC women play at schools in California, Arizona, Washington, and Oregon. This year we especially enjoyed following the progress of senior Cassie Harberts. She's a forward and makes a lot of points each game. She's a great athlete, but she's very humble and gracious to her fans. I remember her talking with a group of high school players after a home game with lots of pictures, autographs, and encouraging remarks. Cassie has wonderful support from her parents. This season both her mother and father faithfully came to each of her games and cheered their hearts out. Here's Dad celebrating the USC victory on the Jumbotron. We were so happy for the entire team as they fought their way to become the champions of the tournament. Congratulations to every woman on the team, the support staff, and Coach Cooper. What keeps our spirits up during the long winter months are sunny, even partly sunny days. The reflections of mountains, clouds, and blue sky make such a beautiful sight. This picture is looking up at the high country near the head of Jervis Inlet. It is easily visible from Powell Lake on a clear day. This picture is looking up towards Chippewa Bay and First Narrows as we are heading home. What a wonderful place to live. 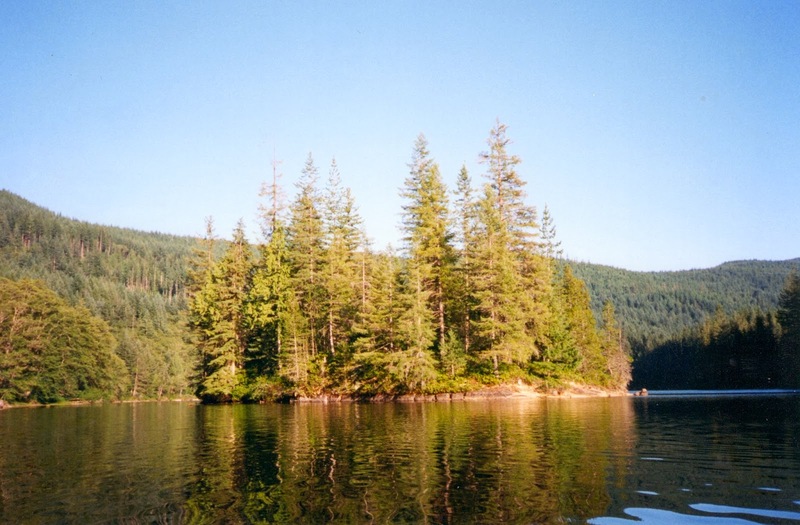 The Saltery Bay Provincial Park day-use area is a great spot for a summer picnic, winter stroll, or launching a boat. We got two out of three. Our good friend John helped us borrow his brother's tin boat to take a quick spin on the chuck (ocean). It may be winter, but we can get nice days with calm seas. To get to the launch ramp, you had to pay a toll to the resident gull. Fortunately, his fee was a simple snack. Tuesday I wrote about sourdough bread. I love to bake, but don't do it often. Wayne and I are watching what we eat, so it takes a long time to get through a large loaf. Croutons are one way to enjoy bread without eating a lot at one time. And croutons baked to a crunchy hardness last for a long time. My recipe is simple. Slice sourdough bread. Spread lightly with margarine. Sprinkle with garlic powder, salt and paprika. Cut into cubes and bake at 250 degrees. When golden brown and crunchy they're done. In addition to salad toppers, they make a tasty snack. Yum! Powell River, British Columbia, is surrounded by lakes large and small. Drinking water for the city comes from nearby Haslam Lake. For that reason, access is limited to non-motorized boats including canoes and kayaks. 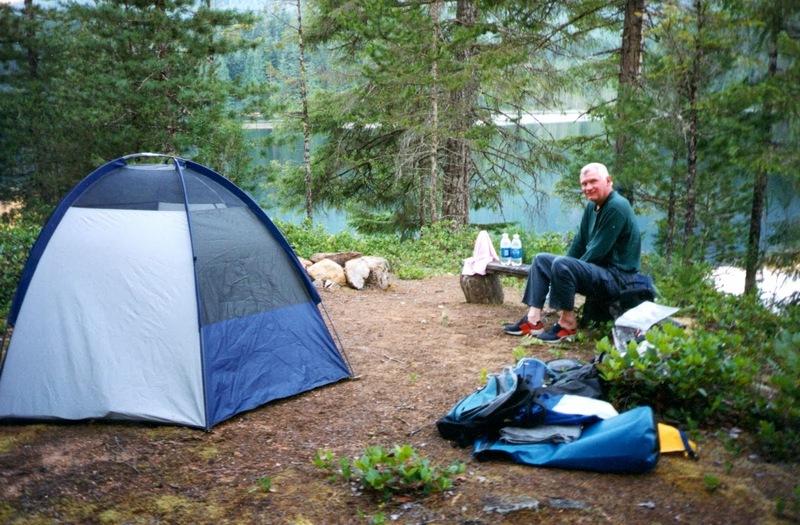 Wayne and I enjoyed an overnight kayak trip on Haslam Lake. We launched at the south end and parked our car in a turnout on the nearby Duck Lake Forest Service Road. 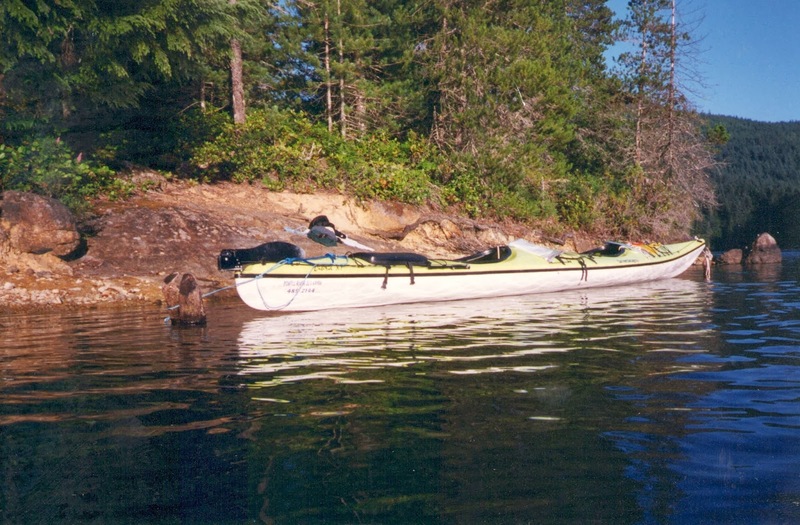 Like many other lakes in the area, Haslam Lake has a long logging history. Float camps and a long gone railroad served the early 1900s forest industry. 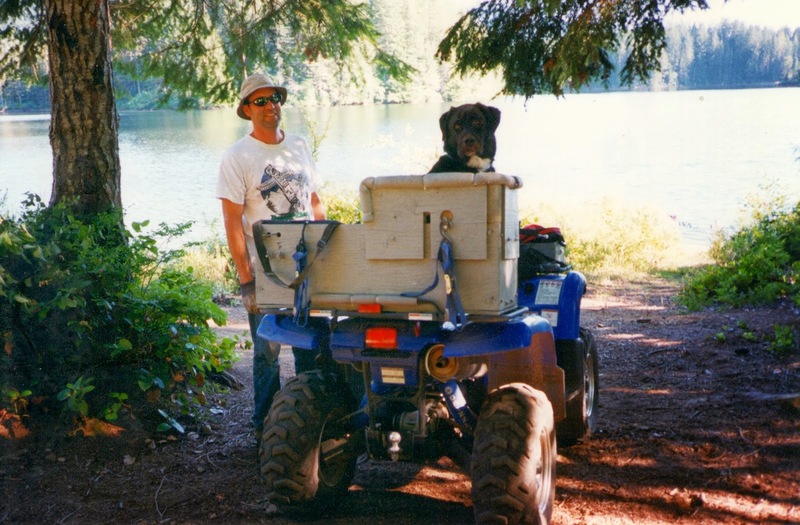 You can reach the head of Haslam Lake by water or ATV following forest service roads, logging roads, and hand cut trails. On our trip, our good friend John and his dog Bro met us for lunch and a swim. Bro enjoyed hunting for frogs in the warm shallow water. Near the head of the lake are several small islands. One has a primitive campsite. That's where Wayne and I spent the night. One warning, the bottom is covered with decaying debris, a perfect habitat for leeches. Wayne learned the hard way. But it was a small price (easy for me to say) to pay for an evening under a sky littered with brilliant stars.